Google is testing yet another method of contacting businesses from search results. This time it’s text-based chats via Hangouts. Twitter user Matt Gibstein first posted screenshots of the functionality on Tuesday. You can see the functionality at work by searching for the Israeli restaurant Dizengoff in Philadelphia. The new feature is under testing so it may not be available for all users, but it was available for both myself and two editors. If it is active for you, you’ll see a new option for Chat under the contact information in the business’ search results card. There will also be an indicator saying whether the business is available to chat or not. 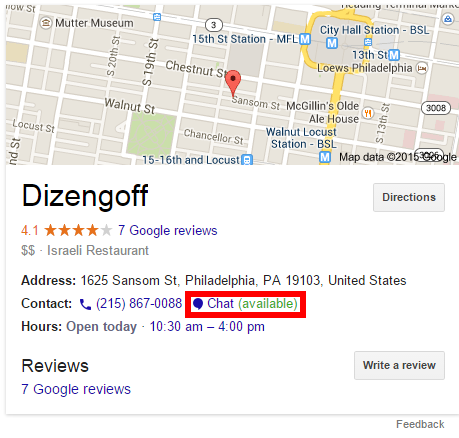 Google is testing a feature that would let you chat with businesses via Hangouts right from a search results page. The story behind the story: Google has a habit of adding new contact methods to search results. Last June, Google added the ability to place voice calls to businesses via Hangouts directly from search results. But Google’s latest Chat feature also mimics a similar service from the social network Path that rolled out last September. Path Talk also offers the ability to have a text chat with businesses, which Path started offering after it acquired TalkTo—the company that originally offered text chats with businesses. Google was unavailable for comment at this writing, but the company did confirm to TechCrunch that this is a new experimental feature it is trying out. 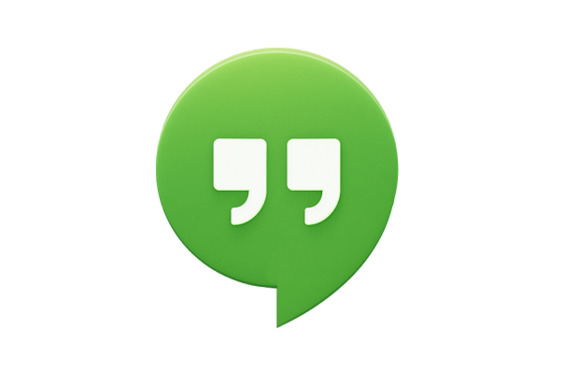 Whether Hangouts chats will become a full-fledged addition to search results is unclear. Answering calls is one thing, but having to answer a constant stream of text chats from Google users may prove to be too time consuming for restaurants, cafés, and shops. This option would clearly be optional since businesses would have to add a Hangouts account to their contact data. Regardless it’s an interesting idea that could make Hangouts an even more valuable tool to Google users—especially those with an Android phone.